Love and freedom are the foundations of healthy life, both at the individual and social levels. Love and freedom are intertwined so tightly in human life as to form a single unit -- a duality. Our needs for both love and freedom, and the fact of their connection within us at both the individual and social levels, stem from our very nature. The duality of love and freedom is not something optional or tacked-on; it is a basic part of life. We neglect this duality at great peril. Because the expectation and need for love and freedom are interwoven so tightly at the core of human life, societies with low levels of love and freedom work poorly. Indeed, without enough love and freedom, any society quickly becomes a nightmare. First, we are all the same. We are all brothers and sisters; we are all one. Second, we are all different. Every person is unique, and each of us has his or her own preferences, thoughts, desires, needs, abilities, and goals. The depth of those two characteristics (all the same; all different) and their dramatic interconnections make the duality of love and freedom critical to our well-being. Yet, as the news  constantly reminds us, we humans have done a poor job of fostering love and freedom. Without improvement in the levels of love and freedom in the world, our species may not survive for long. As I have described before , the combination of 21st Century technology and our present levels of emotional damage and tyranny could easily be enough to produce an extinction event for the human race. Being "all the same" does not mean that we are all identical; it does mean that we are all one family. Each of us is an instance of the human race and of life itself. Not only are humans incredibly similar to each other at the genetic level,* human DNA is more similar to mouse DNA than it is different . For that matter, there is surprising overlap between human DNA and DNA from flies, jellyfish, and even sea sponges . This makes sense: genes that work well survive and propagate; genes that do not work well disappear. Problems of protecting oneself from pathogens, parasites, and predators, of extracting energy from oxygen and nutrients, of protecting oneself from oxidative damage even while using oxygen as a key fuel for life, of building various components of one's cells, of creating enzymes and proteins to perform various functions, and many other things are common to nearly all forms of life on Earth. Many of the genes we carry have been keeping life alive for tens of millions of years -- even for hundreds of millions of years. * A very recent project  found roughly five times greater genetic variance than previous estimates but still found that one person's genome is likely to be about 99.5% the same as another's. We all need air*, water, and food. We all have a range of conditions in which we are comfortable, and we seek these conditions out and avoid those which make us uncomfortable -- that is, we seek pleasure and avoid pain. All life does this, including insects, plants, and even one-celled organisms. The roots of a plant seek water and nutrients; the leaves seek light. Life is programmed to seek what it needs and to avoid that which is harmful or deadly. Life that isn't so programmed does not survive for long. Because we are all made from the same materials (for the most part) and by necessity have the same prime directive to survive and reproduce, it is natural that there is much overlap in what living organisms need to live and to thrive. *Even apparent exceptions such as anaerobic  bacteria still require nutrients and seek them out, while avoiding harmful conditions. Consciousness is yet another thing we have in common with our brothers and sisters, and with much of life generally. The extent to which other species are conscious is a hotly debated question: Alun Anderson, Editor-in-Chief at New Scientist , believes that even "cockroaches [and insects generally] are conscious ." On the other hand, many people believe that only humans are conscious, and only adult humans, at that. Douglas Hofstadter, a Professor of Cognitive Science at Indiana University , believes, in so many words, that "consciousness = thinking." Hofstadter is the author of I Am a Strange Loop  and of 1979's Godel, Escher, Bach  -- which puts forth a similar view -- so the idea that consciousness actually CONSISTS OF higher-level thinking is reasonably mainstream. Philosopher Daniel Dennett, author of the influential Consciousness Explained , shares Hofstadter's view, although both also acknowledge, vaguely and somewhat maddeningly, that some form of consciousness may be possible or even likely in other species. Here is Dennett on the topic , and here is a discussion thread  which quotes Dennett (see second comment) and which includes comments from others espousing the same basic view: that children are not conscious. I believe the biggest factor preventing wider agreement on the topic of whether children, animals, and even insects are conscious is the numbing of lower levels of consciousness typical of adult humans, combined with the difficulty of identifying threads of lower-level consciousness as such; one's consciousness feels all-of-a-piece. I experience "me" as a single, unified entity, no matter that different levels in my brain are creating streams of consciousness that are different in kind from one another. Many people find it difficult to imagine a version of themselves without the abstract, upper-level consciousness that Dennett, Hofstadter, and others see as being the totality (or nearly so) of adult consciousness. * I am ignoring the colorfully termed "zombie problem " -- essentially, the impossibility of proving that any being, including your own spouse, is actually conscious instead of merely acting, mechanically, in a fashion that appears conscious. Consciousness is a perfect example of the "all the same, yet all different" duality of life, because modes of consciousness do differ and yet without consciousness, none of our sameness or difference would matter: it is consciousness itself, something shared by all, that sparks the meaning of life into existence. The empathy we share with others is both a sign and a result of our sameness. The freedom we offer others comes most reliably from that same empathy; it is a reflection of our understanding that each person has his or her own preferences, thoughts, desires, needs, abilities, and goals. A society of free human beings functions better than does a society of slaves. A society of loving, connected people functions better than a society of disconnected neurotics or (at the extreme) sociopaths. Love for others includes respect for the rights of others, which is necessary for the market to function properly. Love includes compassion, which is necessary to fulfill needs where the market alone might not. 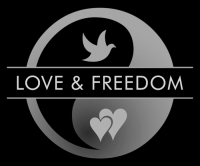 Freedom optimizes human action (in ways that matter to human beings), which ensures that needs are attended to; in turn, the fulfillment of need protects and fosters love and compassion. In sum: Love and freedom form a fundamental duality in human life. One without the other soon becomes a disaster, as would be night without the day.